I received this item free in exchange for my honest opinion, all views and opinions are my own. Sponsor is responsible for prizing. Kale, a fisherman's daughter, discovers something shocking, while being trapped deep within. Will her discovery be the undoing of her people, or is there still hope? Her discovery may lead to the destruction of an entire nation. Can she risk it all to help save her people? “The Stolen Dragon of Quanx” is the first novel in (The Eyes Trilogy) by: Becca Mann. After finishing “The Stolen Dragon of Quanx,” you will be begging for it’s sequel! Becca Mann is the author of “The Stolen Dragon of Quanx,” and what is so amazing about this young author is, her age- she's only a teenager! She currently writes teenage children's and young adult fiction fantasy. Becca has traveled and written in six of the seven continents, and also swims for the United States. She hopes to make it to the 2016 Olympics. 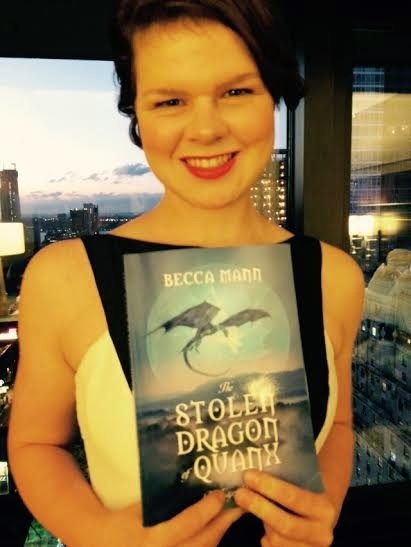 The main reason I was so excited to review “The Stole Dragon of Quanx” is because Becca Mann is so young, yet her age has not stopped her from achieving such great things early on. The fact that this genre is one of my favorites played a role as well, however I found it a great privilege to be considered to write this review. Writing a book at any age is an amazing accomplishment, let alone writing and publishing before you are old enough to vote. Kale and Sawyer are two of the the main characters in “The Stolen Dragon of Quanx.” As you read, you will follow them as their lives change forever. You will see them develop through ever changing circumstances. This book is suited for young adults, and in some cases I believe that an experienced reader in lower grade levels would enjoy it as well. The story line is complex, but not so complex that it would be hard to understand for the younger reader. However, as I had just mentioned, it suites young adults, and adults alike. I loved the fact that the people of Quanx have unique eyes. Their statute in their society rides primarily on their color for example, and I find this very intriguing. The ability to tint the eye color to change your statue is a dangerous, but doable action. Would you do what it takes to help your people survive? Could you be deceptive to save those you care about? I could continue with some of the fascinating aspects of this book, but in order not to spoil, I will leave you with my word that if you love a book in this genre, then “The Stolen Dragon of Quanx” is for you. It is full of fantasy, the whimsical, imaginative story lines, with a bit of dystopian flare thrown in. Me-What was your main inspiration that influenced your writing? Becca Mann-Probably a mixture of life experiences and books that I had read. My life experiences always end up making an apperance in the story, even if I don't realize it right away. I also always get inspired after I read a book. Me-What entity or entities do you draw the majority of your support from? Me-What are you currently working on, literary or otherwise? Becca Mann-I'm currently working on the second installment of The Eyes Trilogy. I'm very excited about Book 2, but I still don't have a title for it. I'm also working towards Rio 2016 in swimming. Me-What are you currently reading, or have just completed reading? Becca Mann-I'm reading two books right now: The Death Cure (third installment of The Maze Runner series), and Scorpion Mountain (fifth installment of Brotherband Chronicles). Me-Which author or authors would you say have shaped your literary world? Becca Mann-J.K. Rowling and Jennifer Nielson. Harry Potter is so creative and thought out that it never fails to inspire me. As for Nielson, I love how all of her characters are so developed and relatable. Me-Do you listen to music while you write? If so, what type, and what artists? Becca Mann-I occasionally listen to music while I'm writing. It's usually when I'm looking for inspiration, or when I hear a song and realize that it relates to what I'm writing. Sometimes the lyrics of songs give me ideas. I find that Les Miz is always a good playlist to play when I'm trying to get a lot of writing done! Me-Our readers will want to know if there is more to come in terms of a book series! What can we expect to see, and how far into the future can we see them? Becca Mann-Readers will definitely be seeing more of their favorite characters in the next books! Kale and Sawyer will both keep their point of view chapters. I'm also adding another consistant point of view, but you'll have to wait for Book 2 to see which character it is! Me-What would your advice be for up and coming authors both young and old? Becca Mann-If you love the story, the characters, and the world you've created, don't give up part way through the manuscript. I've heard it said—and agree—that it's easy to start a story. The hard part is finishing. But no matter how many times you think you can't finish your story, know that you can finish it if you love it enough. Sometimes you just have to let the book write itself. If you let the characters do what they want to do, and not what you want them to do, you'll find that the story will reach a satisfying stopping point. Me-Do you ever get writers block? If so, what is your mental process for overcoming such blocks? Becca Mann-Ahg, I hate writer's block! Halfway through writing The Stolen Dragon of Quanx, I got writer's block for six months. It wasn't that I ran out of ideas; in fact, I knew perfectly well where I wanted the story to go. I was just completely uninspired. I didn't type a single letter. Whenever I get the block, I just force myself to write. After about fifteen minutes of writing it usually goes away. Me-How often do you read, and at what age did you know writing was for you? Becca Mann-I read all the time. This is one of my favorite quotes: "Until I feared I would lose it, I never loved to read. One does not love breathing." As soon as I could read and write, I was reading and writing. I think I was just born with it. Me-From the first letter written, to your first book on the market, how long was the writing process for you? Becca Mann-Five to six years. I started writing when I was eleven (on a smartphone on my way to swim practice) and finished my first draft when I was fifteen. I only wrote about four chapters when I was eleven and hardly wrote a paragraph when I was twelve. I probably only wrote about 10% of the book during those two years. I got re-inspired when I was thirteen and probably wrote another 40% of my story that year. I wrote the most, however, when I was fourteen. Whenever I had free time I would run into my room and start typing away. About six months after I turned fifteen, I had finished the first draft. It took me another year and a half before I got it published. I rewrote the chapters that I had written when I was eleven and read the book over and over, looking for plot-holes and mistakes. I personally found the publishing part of the process the most difficult. I would much rather create a story than try to decide which format would best fit the book! Me-Please give any other advice, notes, or personal material that you would like readers to know. There are other aspects that are pretty cool, too. For example, the story of the various swords used by the tribes-folk are interesting and unique. You learn the story of Kale’s sword, which is meaningful in the book and in the future books. You may not understand it in your first read, though. Of course there is the straight up adventure, honesty, loyalty, deceit and daring. Kale hides the fact she is a girl so she can train as a warrior. This is illegal as girls aren't expected to go on adventures. She gets stuck in dark and rank tunnels for days, sees people killed, nearly loses an eye, and has a dragon haunt her in her dreams, all while losing her friends and feeling responsible for bringing war to Quanx. She questions her actions and motives which change as the book progresses. She makes loyal friends and scary enemies. One of my characters, Paka, has a big back story, but there are too many secrets to highlight Paka here. Readers are saddened by Paka’s story and want to know how she came to be the person she is. I wonder what they will think about Paka in book two! Sawyer is another character everyone has an opinion about. I am always curious about what readers think of him and whether or not they think he is good by the end. He is certainly a victim of his circumstances and you are hopeful when he makes the right choices and disappointed when he doesn't. I could go on and on about everyone in the book. Tyler has been a common favorite. As you learn in the book, he likes to protect his eye color. He is one character who remains true to his goodness. I have been told Brandon, Velvet, Vulia, and Winikona are favorites as well! Learn more about author Becca Mann at her website, or you can chat with her on Facebook and tweet with her on Twitter. Enter To Win Your Own Copy Of "The Stolen Dragon of Quanx"! One lucky entrant selected by rafflecopter will receive a copy of "The Stolen Dragon of Quanx" by Becca Mann! (ARV$20) Open to readers in the US, 18 years and older. Open for entry from 1/30-2/16/15 at 11:59pm EST. Winner will have 24 hours to respond to the notification email to claim the prize or a new winner will be selected. Use the rafflecopter below to enter. Good Luck! Wonder what happens at Vitchireonyo Palace, this books sounds fascinating and it is great that it is written by such a young author. My grandson would like this, and Island of the Peasants is on the map. I'd like to read this book because it looks very interesting. The Xangterro Palace on the map. I'm a sucker for books with dragons so I want to read this book.